Oldcastle hosted Ratoath for round 6 of the ACFL Division 1 this Sunday morning. With an unusually early throw in of 10.30 due to Meath playing in Pairc Tailteann there seemed to be a very relaxed atmosphere for the game. Indeed minds may well have been elsewhere as this game started - but nonetheless the small crowd were to be well entertained. The home side started the better and added a well worked goal to a couple of early points to take an early lead. Ratoath were finding it hard going but a well worked goal kept them in touch and helped them settle into the game. With a tricky wind blowing diagonally across the pitch both sides found it hard to get scores! Ratoath were to have the better of the second half. With their backs tightening up a platform was created for the forwards and despite some wild shots they managed to rack up several more points. A biting, bitter and twisted wind was whipping through Millbrook this morning, as Oldcastle took on Ratoath in this Div. 1 encounter. Playing with the wind, Oldcastle took the first two scores courtesy of Robbie Farrelly, before Ratoath took one of their own. A spell with some great teamwork from Oldcastle followed, summed up by the following score from a Packie Kevin kick-out to Oran O’Reilly, upfield by way of Terry Farrelly, Ger Reidy, Darren Hawdon and Paddy Rahill. He then chipped it nicely in to the waiting forwards: to Colin Hawdon who passed to Jason Scully and finally on to Lee Healy for a super goal, and just reward for the input. Packie Kevin made some super saves in this half also, but all was undone by a dodgy line-ball decision which went Ratoath’s way and resulted in a quick goal. Ratoath edged ahead before a Jason Scully goal put Oldcastle into the lead again, but a few more from Ratoath before the whistle blew left it level at half-time: Oldcastle 2-04, Ratoath 1-07. 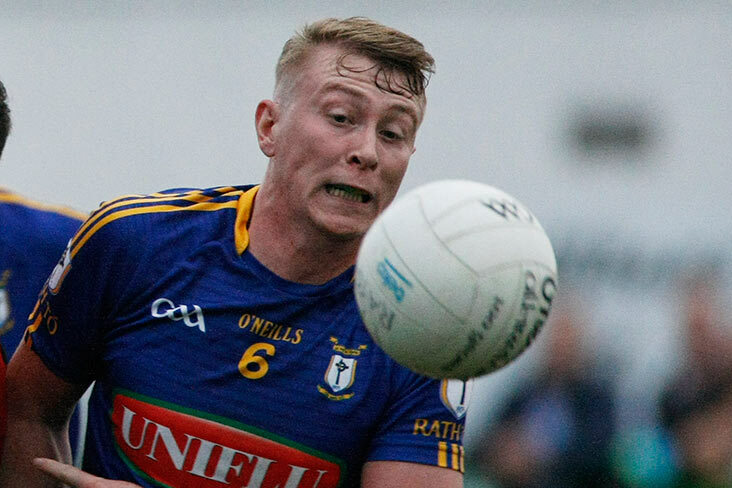 Ratoath had the advantage of the stiff breeze in the second-half, and while Oldcastle stayed with them and levelled score for score for 15 minutes, they then crept ahead and stayed there. Oldcastle never gave up and reduced the deficit near the end, but the opposition managed to stay in the lead and were still there at full-time: Oldcastle 2-09, Ratoath 1-16. Oldcastle: Packie Kevin, Louis Colleran, Cian McPartland, Oran O’Reilly, C.J. Healy, Terry Farrelly, Dylan Garrigan, Paddy Rahill, Ger Reidy, Keith Connell, Darren Hawdon, Robbie Farrelly (0-05), Lee Healy (1-00), Jason Scully (1-02), Colin Hawdon (0-01). Subs: Paddy Gilsenan (0-01), Ronan Maguire, Rory McHugh, Stephen Lawless.